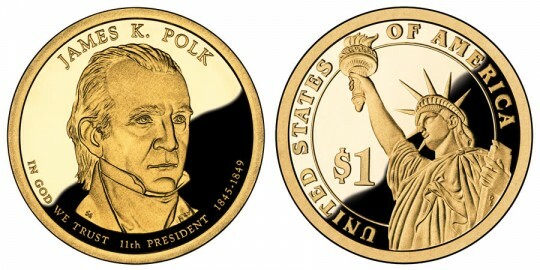 The James K. Polk Presidential $1 Coin was scheduled to be released August 20, 2009 to honor the eleventh President of the United States. Pledged to serve only one term as president, he nevertheless spent many years serving his country. Polk, educated as a lawyer, was quite successful in his law practice, but his focus turned quickly to the political forum. He served a few terms as clerk for the Tennessee State Senate before running for a position himself in the State Legislature. Not satisfied with state politics, he then ran for and won as a representative to the United States Congress in 1825. Serving in this position for over 10 years, his national political power resulted in his attaining the position of Speaker of the House. Then, in in 1839, Polk returned to Tennessee where he became governor of the state. His re-election bid 4 years later, however, was not successful. While not happy with the loss, Polk would soon achieve greater things. "It has been well observed that the office of President of the United States should neither be sought nor declined. I have never sought it, nor should I feel at liberty to decline it, if conferred upon me by the voluntary suffrages of my fellow citizens." As a show of good faith to his fellow Democrats, Polk promised to only serve one term as president, but he had lofty goals for that one term. Upon actually winning the office, Polk's major ambition was to expand the country and lower tariffs. He succeeded on both those items. 1. Texas was admitted to the Union. 2. Through a treaty with Great Britain, The United States took possession of the Oregon territory. 3. Following a short war with Mexico, they ceded California, Nevada, Utah, most of Arizona, and parts of New Mexico, Colorado and Wyoming to the US. Achieving his objectives took its toll on Polk's health, and he died 103 days after leaving office, serving only the one term. Designed by Susan Gamble and sculpted by Charles Vickers, the obverse of the Polk Presidential Coin features an image of Polk with the inscriptions "James K. Polk", "11th President", "In God We Trust" and "1845 -1849." The Statue of Liberty is featured on the reverse of the Presidential $1 Coin. Circling the edge is "UNITED STATES OF AMERICA" and "$1" is shown to the left of the image. It was designed by Don Everhart.